While attending SHOT Show 2015, we ran into the folks from Edge Eyewear. Having quality safety glasses while hunting is very important, however there’s one issue that I’ve run into with various brands; fog on the lenses. This is very frustrating, as the fog on the lenses can block your view, forcing you to remove the glasses to clean them off; or remove them all together, which increases your risk of eye injury. What caught my attention about the Edge glasses was their Vapor Shield technology. At their booth during the Industry day at the Range event, they had a steam machine and were showing how their glasses would not collect moisture, while they would show how the glasses we were wearing did. One thing I’ve run into a lot while hunting in the colder months (and even when shooting at the range in the summer heat) is having the lenses on my glasses fog up, obscuring my target. This is very frustrating, and can cause you to miss a shot, or even an opportunity to take a game animal. We chose to test their Hamel series glasses, which feature their G-15 lenses with the Vapor Shield anti-fog technology. They offer the Hamel in various colors, including Sand, Multicam, and Gray Wolf. You can also choose for thin temple arms (Sand and Gray), or Normal (Multicam). For those that need polarized lenses, Edge offers those lenses as well (which also feature the Vapor Shield technology). While the glasses we tested came with their G-15 lenses, they also offer Clear, Tiger’s Eye, Polarized Gradient Smoke, and Polarized Copper lens options. Each offers a different set of specifications for different situations (overcast, bright sunlight, etc. ), allowing you to tune the glasses to your needs. We liked the options listed for the G-15, as they claim that they offer “contrast and definition while offering a cooling sensation to the eyes. This technology was designed by the U.S. Air Force to maximize transmission of light at 555 nm (green/yellow light). The G-15 lens is perfect for a variety of bright conditions.”. They note a light transmission rating of 15%. Their Tiger Eye lenses would make a great choice for those hunting in overcast or marginal lighting, as they offer increased light transmission (50%), along with a high-contrast view. Here you can see the thin temple Sand glasses with the G-15 lenses, and a pair of regular temple Multicam frames which also feature the G-15 lenses. Both are quite comfortable, with the thin temple frames being my favorite. A comparison of the thin and normal temple options for the Hamel frames. Here’s a close-up of the arms on the frames, which illustrates the differences between the thin and normal temple frames. The advantage of the thin temple option is that you can use them with ear pro muffs, and still get a full seal; ensuring maximum hearing protection. 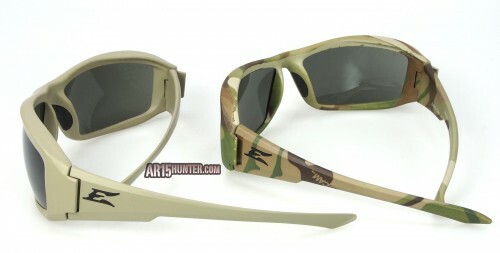 Another view of the Hamel Sand and Multicam frames. I’ve used a lot of different glasses over the years, and I’m really digging the Edge Eyewear Hamels. 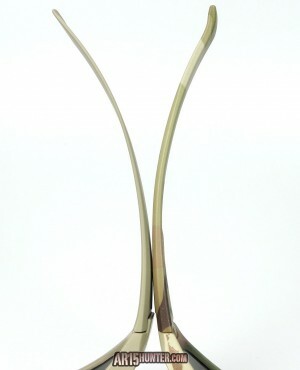 They are inexpensive, at about $50 for a set, however they are not cheaply made by any means. The frames are tough, so tough you can bend the frame arms back and forth, and they won’t break (within reason, of course). The biggest selling point to me, as a hunter/shooter, is the Vapor Shield technology. I used these glasses during some extremely cold weather here in Ohio, and I had ZERO fog on the lenses. It didn’t matter what the temperature was (sub zero often), and even when going from outside in, where the temperature change could be as much as 70 degrees, the glasses stayed crystal clear. 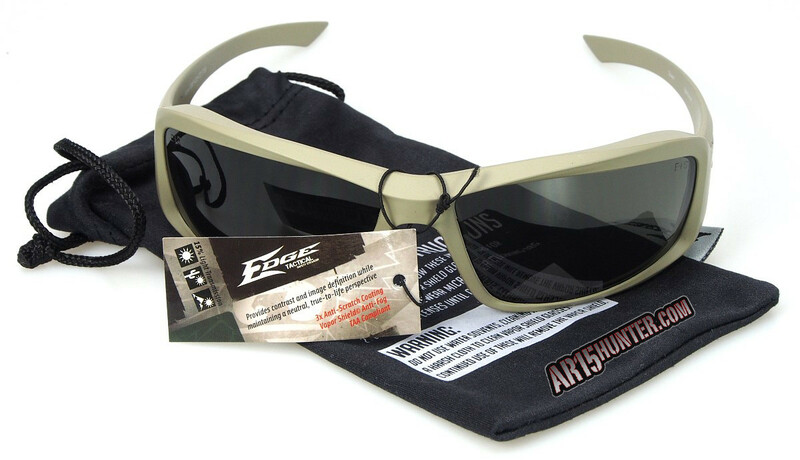 If you’re looking for a nice set of range glasses, shooting glasses, or even just some nice affordable sun glasses, you need to check out Edge Eyewear. They offer a plethora of different options, and the prices are very affordable. Many of their frames, like the Hamels, look great too. Check out the Edge Eyewear website for more details. Click here to grab a set of Hamels on Amazon.